How to test by adding the Oracle JDBC driver to your classpath. 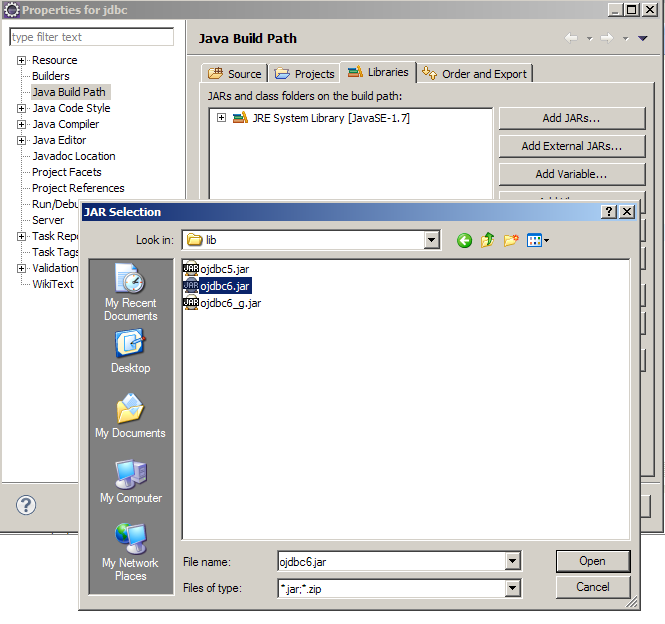 Java JDBC programming requires a JDBC driver for the database. You can find the Oracle JDBC driver in C:\oraclexe\app\oracle\product\11.2.0\server\jdbc\lib. Among the files in the directory, ojdbc6.jar is the JDBC driver we will use. The following JDBC test file is a program that retrieves all the records in the scott account's EMP table and prints them. Save the test file as GetEmp.java in the C:\jdbcTest directory. The listener bridges Oracle with external applications. 127.0.0.1: It is the IP of the server where the database is installed. XE: It is the SID name. SID identifies Oracle database objects. It is an exception that the GetEmp class can not be found. Verify that you ran it where the GetEmp.class file is located. Make sure the classpath contains the current directory (.). It is an exception that the startup class of the Oracle JDBC driver can not be found. Make sure you have added the Oracle JDBC driver to your CLASSPATH. There is a possibility that Oracle's Listener is not in service. At the command prompt, run lsnrctl status command to check the status of your service. The password for the scott account is wrong. If scott's password is not tiger, modify the GetEmp.java source and test again. Here's how to use the -classpath option when compiling and running. You can easily test it by creating the following batch file. 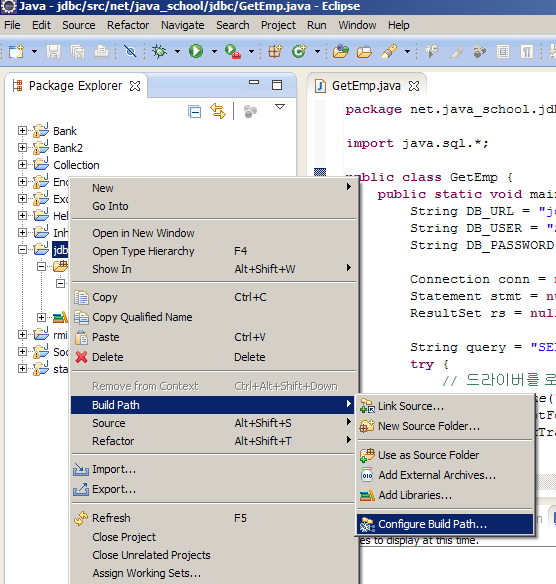 Eclipse does not refer to the classpath environment variable. 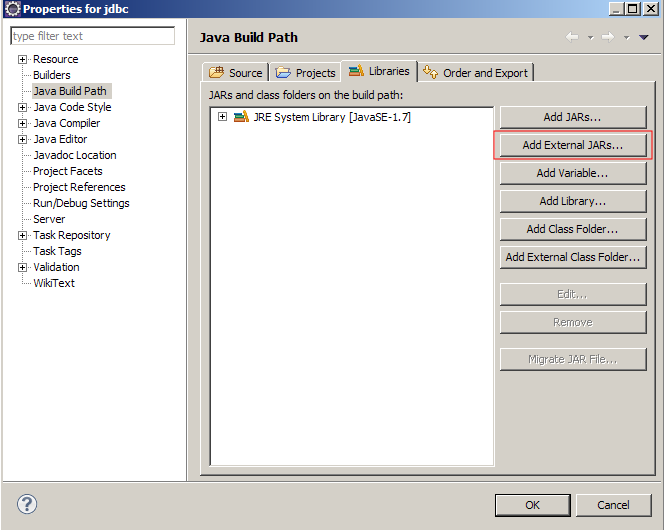 To run GetEmp.java code in Eclipse, Eclipse manages your code on a project-by-project basis, so you need to create a project once. 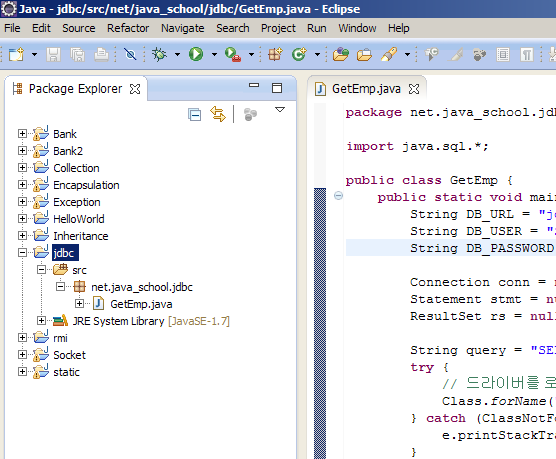 Create a project named jdbc as shown below, and create GetEmp.java to belong to a package called net.java_school.jdbc. Select the project with the mouse. Click the right button and select the menu as shown below. Select the Libraries tab and click the Add External JARs .. button. 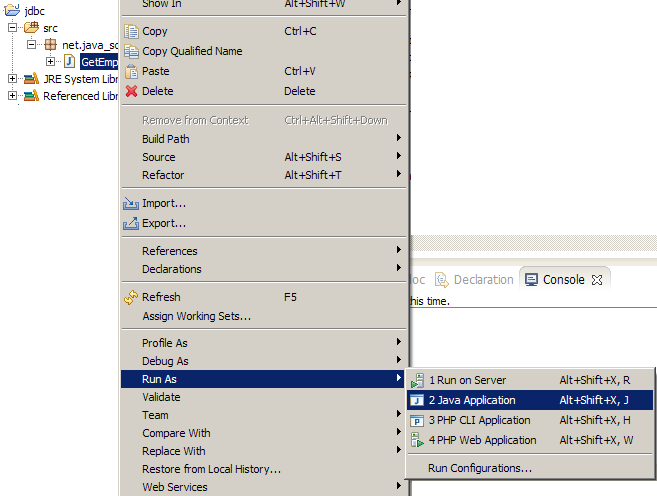 Add the Oracle JDBC driver file. 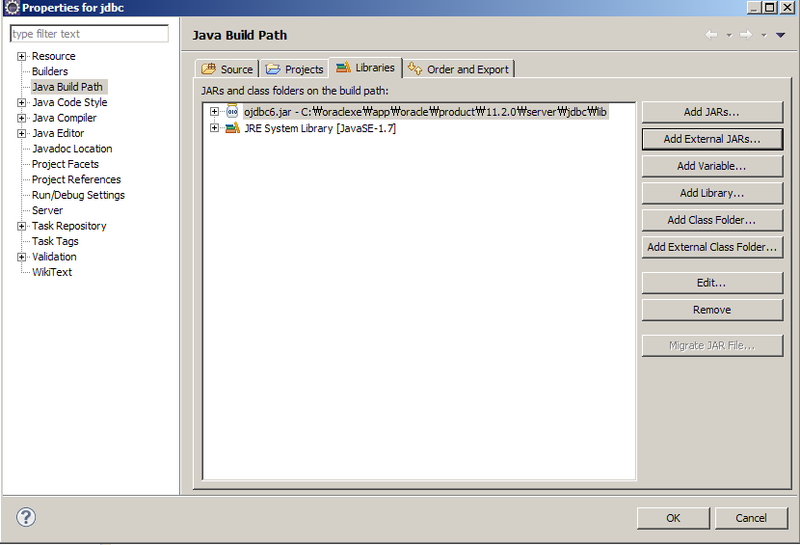 In the Package Explorer view, select GetEmp.java with the mouse. Click the right button and execute as below.